Recently funded through Indiegogo, the Mi Guitar promises "the joy of playing guitar without the pain of learning", which sounds good to us. It's actually a simplified guitar, or a more advanced version of the device that goes with Guitar Hero, so you can 'play' some well-known hits without the intricate finger work. It connects to your computer via Bluetooth, and the software that goes with it then takes you step-by-step through playing the hits of your choice. You're not actually learning to play the guitar, but you're getting a decent approximation of it, so it might suit those without much time to devote to their craft. The Instrument 1 from Artiphon is unlike anything you've ever seen but can mimic the sounds and feel of a guitar, piano, drum pad, violin and several other instruments. It's different from the norm, which makes it easier to pick up and play with, even if you're not learning in the traditional sense. The experience is "focused on exploration and creativity rather than skill sets and signal chains" in the words of Artiphon, which is a pretty good description of what the Instrument 1 is. Forget all of those instruments with years of heritage behind them and embrace the next generation of sounds. There are actually a surprising number of keyboards that can light up to tell you where to put your fingers, and the McCarthy Music Illuminating Piano is another one of them (and one of the best around). It has 61 keys and MIDI support, and you plug it into your Mac or Windows machine via USB. From there you can use the accompanying software to get your instructions and lessons, and it's easy to customise the device to suit your own level of ability and personal preferences. You can in fact learn any piece of music you like, with software that gets more advanced as you grow in confidence. The Fretlight guitar takes the illuminated keys concept and transfers it to guitar, giving you clear signals and guidance for where your fingers need to be to produce the tune that you're after. You can choose from acoustic or electric options and there's a choice of mobile apps to help you get playing. You can connect up via Bluetooth or USB and the guitars have lithium-ion batteries built into them to keep the lights on while you're playing. Even with the integrated learning system, Fretlights look and play like real guitars, so no one's any the wiser that you've used one to learn the ropes (or strings). If you want to learn the drums but don't want to have to set up a whole drum kit in your lounge, Aerodrums can help. These wireless sticks and pedals connect up to your computer, which reproduces exactly the right sounds based on your movements, even though you're essentially playing thin air. It's an impressive bit of kit, which includes a camera to keep track of how you're drumming. There's not much in the way of actual instructions or tutorials for learning to play the drums though, so once you've got everything set up, you'll need to find lessons from somewhere else on or offline. 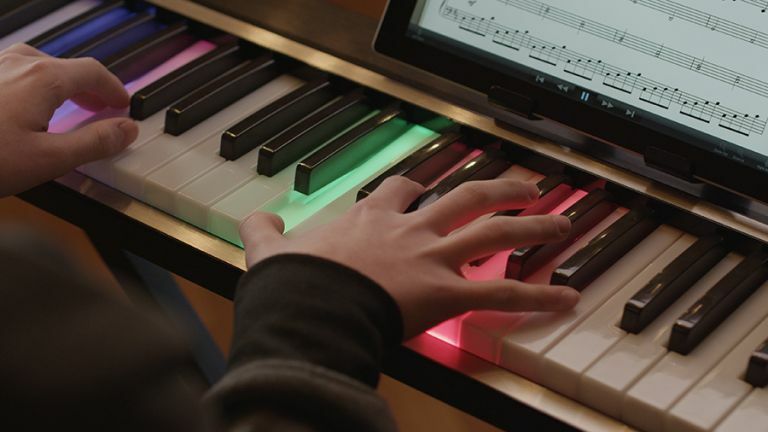 PianoMaestro isn't a separate instrument, it's a USB-powered strip of LED lights that sits on top of your existing piano or keyboard and tells you which keys to hit and when. You plug it into your laptop, load up the music you want to play, and PianoMaestro takes care of the rest. If you've already got a piano in your living room then obviously you can save yourself some money by opting for this rather than a brand new instrument. If you don't already have a piano or keyboard, then it's not quite as immediately appealing, but you could always shop for a cheap second-hand instrument.